Students in this Juniors Abroad experience will explore the development of the Christian faith in the cultures of Ireland and England from Celtic times to the present. Students will also experience the beauty of the culture and geography of Ireland, Wales and England. Students in the course will also study two of the greatest Christian intellectuals of the 20th Century, J.R.R. Tolkien and C.S. Lewis, and examine how they confronted their world for Christ. In addition to reading some of the work of Tolkien and Lewis, we will visit key historical sites in Oxford and Ireland associated with both authors. Our trip will begin in Ireland where we will visit Galway, the Aran Islands, and Dublin. From Ireland, we will ride the ferry to Wales where we will visit ancient monastic sites and medieval castles. From Wales we will venture to Bath and then travel on to the famous cathedral city of Salisbury where we will visit one of England’s most famous cathedrals as well as Stonehenge. We will travel from Salisbury to Oxford where we will walk in the footsteps of C.S. Lewis and Tolkien. Finally, we will ride by rail through the English countryside and end our trip in the city of London. The itinerary below provides the details! Day 1 – Leave PDX for Shannon airport, western Ireland. Arrive Galway – Ireland. Galway is Ireland’s unofficial cultural center. Day 2 – Ferry boat to the Aran Islands off the Irish Coast. The Aran Islands are home to some of the most significant early Christian sites and beautiful scenery as well. Enjoy a bicycle ride on the island! Day 3 – Day trip to Clonmacnois. In addition being one of the oldest Christian communities in Ireland, the site is also home to the Cross of Scriptures and some of the most famous High Crosses in all of Europe. Day 4 -- Trip to Connemara National Park one of the most beautiful sites on the Irish coast. Evening train to Dublin. Arrive Dublin, evening of Day 4. Day 5. Visit Trinity College home of the ancient manuscript known as the Book of Kells. Afternoon visits to St. Patrick’s Cathedral and the National Museum of Art. Evening attractions in the city. Day 6. Visit Kilmainham Gaol (ideal for film fans, as many popular movies such as Braveheart have been filmed here). Like any major city there are many theater options as well. Day 7 Morning, ferry to Llandudno, Wales. Llandudno, Wales. The small city of Llandudno is a resort destination in Wales known for it's amazingly beautiful beaches, the most well known of which is Llandudno West Shore. Day 8. Day trip to Caernarfon Castle. Built in 1280 by King Edward, it was one of the most expensive castles ever built in England. Day 9. Day hike along the Wales coast to visit the 12th century church of St. Tudno. Day 10. Rail travel to Bath. Bath, England. Bath is one of England’s most elegant and historic cities. Day 11. Visit to the Jane Austen Center. Afternoon at the Southgate shopping centre. Day 12. Visit The Great Bath, a natural hot springs bath constructed in 70 AD, now one of the best preserved ruins in the world. Late afternoon travel to Salisbury. Salisbury, England. Listed as one of the top 10 cities in the world to visit by Best in Travel magazine, Salisbury is home to Stonehenge and Salisbury Cathedral. Day 13. Day trip to Stonehenge. Day 14. Visit Salisbury Cathedral. Evening travel to Oxford by rail. Oxford, England. 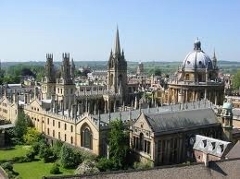 Oxford is one of the most famous university towns in all the world. In addition to its historic beauty it was also the place where Tolkien and Lewis spent their teaching careers. Day 15. Tour of Oxford including special sites associated with C.S. Lewis and Tolkien. Day 16. Visit and Tour of Warwick Castle. Day 17. Travel to London by rail. Afternoon visit to the British Museum. Evening on the town. Day 18. Visit numerous London sites in groups: Imperial War Museum, Westminster Abbey, Buckingham Palace, the Churchill War Rooms, the National Gallery, St. Paul’s Cathedral, and the Globe Theater. Take in a Shakespeare play at the Globe. Day 19. Day trip to Canterbury. Canterbury is one of Britain’s heritage cities founded in 597 A.D. It is home to Canterbury Cathedral and home to one of the finest independent shopping areas in England. Day 20. Day trip to Cambridge. Cambridge is England’s other famous university city. We will go punting on the River Cam and visit King’s College. Day 21. Last day in London – your choice of activities. Day 22. Leave from Heathrow airport.